Happy 3 month anniversary/Secret Stairs/ June contest! Comment to win a copy of Secret Stairs! Is today Memorial Day for your late, lamented waist line after three solid days of BBQ and beer? Did you rediscover the outdoors this weekend in the (finally!!!) sun and have now vowed to replace your pasty, winter whiteness with a rosy glow and/or golden tan? Are you trying to figure out a rad dad/grad/birthday/Summer Solstice gift? Did you just realize that today is the three-month anniversary of U Want 2 Go Go and that you want to embrace the blog more fully than you already do???!!!! Go Go’ers, you are SO in luck if you answered “yes” to any or all of the above questions…. 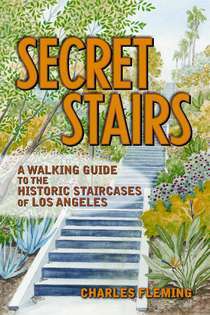 Enter the U Want 2 Go Go anniversary/Secret Stairs/Happy June contest and YOU may be the lucky Go Go’er who wins a signed copy of Charles Fleming’s Secret Stairs (on the Los Angeles Times Best Seller list for Paperback Non-Fiction!) PLUS a private “Secret Stairs” walk with the fascinating Mr. Fleming and three of your nearest and dearest from mid-August on (due to the author’s imminent vacation, during which he will presumably be hunting stairs in exotic locales). To win this excellent prize package, send in your comments and/or suggestions about U Want 2 Go Go. Are there posts that you loved? Ms. Go Go wants to know! Something you’d like to see in the future? Fire away! Do you have a suggestion to help Ms. Go Go be a smooth(er) operator? Start clicking those keys! Every comment (Post before midnight on June 7th, 2010, Go Go’ers!) generates a separate entry of your name in the random, June 8th drawing. So the more you gab at Ms. Go Go, the better your chances of winning! Next Post Hope for Firefighters: a different kind of food truck. I would love to see ideas for family bike rides — not too difficult. For instance, we went looking at loft open houses downtown on our bikes one Saturday. Very fun. Thanks, Lisa, and glad that the MOTA Day post (and others!) work for you. Family bike rides are a great idea! Expect a multi-part bike series in futureU Want 2 Go Go! I really enjoy all your posts. The activities are right up my alley. Can’t get to all of them but I did partake of the Museums of the Arroyo day and dug the people in period costumes! I love your ideas and we have partaken of several. But I think I need to switch away from Daily Update, as the digest comes late at night, and I might miss something. And, for some reason, the digest doesn’t come with the link to the event. Not that it is a problem clicking thru to the posting, but not sure why WordPress doesn’t include that. Thanks, Pat, for the feedback about the lack of a link and the late night arrival of posts. The latter is especially puzzling since the posts are at different times of day. Great minds, Pat…. Several Music Center events will be appearing in upcoming posts! Thanks!